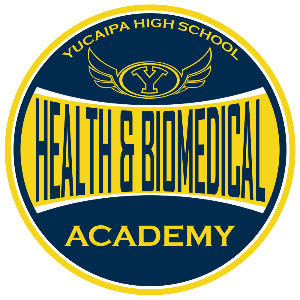 Yucaipa High School’s Health and Biomedical Sciences Academy is a four-year instructional pathway that creates proficiency in foundational principles and skills through authentic classroom and workplace experiences while preparing students for college and career. Students work collaboratively on rigorous, cross-curricular projects, patient assessments, and analyzing industry specific literature to gain foundational knowledge of anatomy and physiology. Through participation in job shadowing and internships, students acquire rob-related skills and an appreciation for serving others in medical and health careers.